All eight of the new civs in Civilization VI: Gathering Storm have now been revealed, but developer Firaxis has made one more major announcement. Confirming fans’ widespread theory about the last trickle from last year’s Vesuvius leak, Eleanor of Aquitaine has just been revealed. Uniquely, she can serve as an alternate leader for either England or France. Eleanor’s leader ability is called Court of Love. It will cause Great Works in each of her cities to inflict -1 Loyalty per turn on all foreign cities within nine tiles, which is a pretty impressive range. 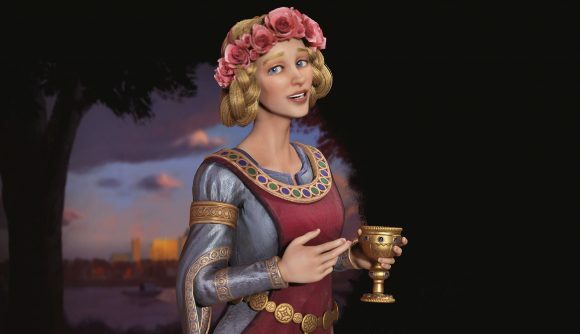 If a city leaves another civ through Loyalty loss and is receiving the most Loyalty pressure from Eleanor, it will flip to her instantly, skipping the free city phase. Obviously enough, this ability requires a hefty commitment to the cultural side of things. You need to generate Great Works and store them in cities near your rivals, then you’ll add the usual Loyalty tools – Amani the Diplomat, Golden Ages, growth, and amenities – to flip enemy cities. You can then build national parks and seaside resorts in the territory you capture this way, further complementing the cultural victory. On the face of things you might think Eleanor works best with France – and you’d probably be right. France gets 20% extra production to Medieval, Renaissance, and Industrial Wonders, many of which have Great Work slots. The French also get double tourism from all Wonders and the Chateau improvement, which work less directly with Eleanor’s ability, but are obviously very helpful for a cultural victory. Don’t discount England, though. The Royal Navy Dockyard gives +4 Loyalty per turn on foreign continents, which is handy if you want to flip a city far from home. The main challenge in getting mileage out of Eleanor is developing cities near your rivals that have enough Great Work slots – not to mention citizens and amenities – to get them to flip. Provided the core cities in your empire each have several different districts, sending all your traders to a new city and setting up internal routes to your heartland should give you a big boost to food and production. Use this to grab a theatre square for the Great Work slots, and perhaps an entertainment complex if you need the amenities.